In his State of the Union speech last week, President Obama put the focus squarely on the middle class, pushing policies that he promised would rescue the broad middle of U.S. society, which has seen little of the benefits of the economic recovery. 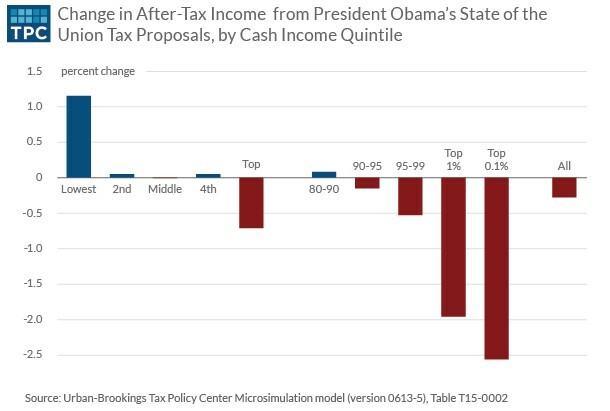 However, an analysis of his proposal to increase taxes on the wealthy in order to cut taxes on everyone else shows the Obama plan doesn’t do much at all for families in the middle income bracket. Obama has been championing the middle class, in part to build support for a potential Democratic successor in 2016. But when plans that are meant to benefit the “middle class” actually do nothing for those in the middle income distribution, how long will the public will keep buying his claims? The losers? That’s very plainly the very wealthy. Under the proposal, the top one percent would see a nearly 2 percent decline in cash income, while the top 0.1 percent would see income fall by over 2.5 percent. The winners are earners in the bottom 20 percent of the income distribution, who would see an increase of about 1.2 percent, or about $175 per year, Gleckman found. For everyone above the bottom quintile up to the 90th percentile, the changes would be trivial — amounting to perhaps one-tenth of one percent. For those in the middle quintile – identified by Gleckman as those earning between $49,000 and $84,000 per year – the net change would actually be a decline in after-tax income of $7. Gleckman also warned of the trade-offs that go with such a plan. Much of the tax increase on the wealthy comes from an increase in the capital gains tax, triggered when an investment is sold for a profit. People wishing to avoid a high capital gains tax might avoid selling assets that they would otherwise prefer to invest somewhere else – meaning that capital that might be more productive somewhere else is effectively locked up.